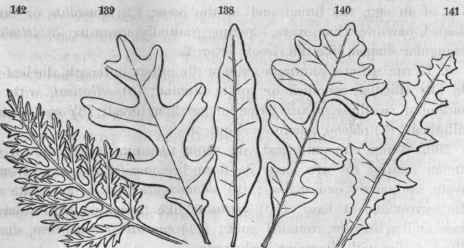 Forms of leaves. 110, Rhododendron maximum. 111, Alnus glutinosa (cult.). 112, Polygonum sagittatum. 113. Pawpaw. 114, Impatiens fulva. 115, Celtis Americana. 116, Circaea Lutetiana. 117, Catmint. 118, Solidago Canadensis - a tripli-veined leaf. 263. That infinite variety of beautiful and graceful forms for which the leaf is distinguished becomes intelligible to the student only when viewed in connection with its venation. Since it is through the veins alone that nutriment is conveyed for the development and extension of the parenchyma, it follows that there will be the greatest extension of outline when the veins are largest and most numerous. 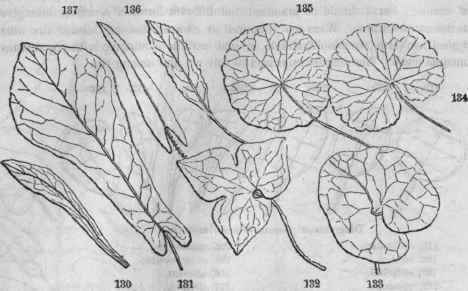 Consequently the form of the leaf will depend upon the direction of the veins and the vigor of their action in developing the intervening tissue. In our description of individual forms of outline we shall select only the most remarkable, leaving others for explanation in the glossary. 265. Feather-veined leaves. Of these, the following forms depend upon the length of the veinlets in relation to each other and to the midvein. When the lower veinlets are longer than the others, the form of the blade will be (1) ovate, with the outline of an egg, the broad end at the base; (2) lanceolate, or lance-shaped, narrower than ovate, tapering gradually upwards; (3)deltoid or triangular shaped, like the Greek letter A.
a. 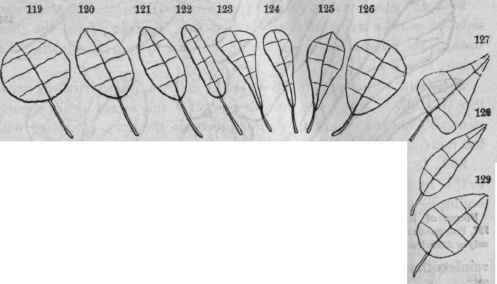 If the middle veinlets exceed the others in length, the leaf will be (4) orbicular, roundish or quite circular; (5) elliptical, with the outline of an ellipse, nearly twice longer than broad; (6) oval, broadly elliptical; (7) oblong, narrowly elliptical. 266. When the veinlets are more largely developed in thb upper region of the leaf its form becomes (8) obovate, inversely ovate, the narrow end at base; (9) oblanceolate, that is, lanceolate with the narrow end at base; (10) spatulate, like a spatula, with a narrow base and a broader, rounded apex; (11) cuneate or cuneiform, shaped like a wedge with the point backwards. 267. Again, if the lowest pair of veinlets are lengthened and more or less recurved, the leaf will be variously modified in respect to its base, becoming (12) cordate, or heart-shaped, an ovate outline with a sinus or reentering angle at base; (13) auriculate, with ear-shaped lobes at base; (14) sagittate, arrow-shaped, with the lobes pointed, and directed backwards; (15) hastate,halbert-shaped, the lobes directed outwards. 268. Pinnatifid forms. The following pinnate-veined forms, approaching the compound leaf, depend less upon the proportion of the veinlets than upon the relative development of the intervening tissue. The prefix pinnated is obviously used in contrast with palmated among palmate-veined forms. 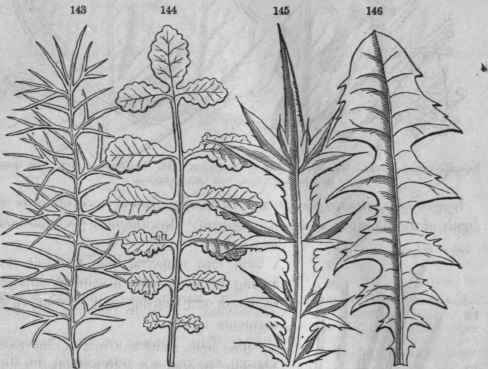 Forms of leaves. 180, Silene Virginica. 131, Magnolia Fraseri. 136, Arabis dentata. 137, Polygonum arifolium. 132, Hepatica acutiloba. 133, Asarum Virginicum. 134, Hydro-cotyle Americana. 135, H. umbellata. Feather-veined leaves, approaching the compound. 138, Quercus imbricaria - undulate. 139, Q. alba (white oak) - lobate-sinuate. 140, Q. macrocarpa - lyrate. 141, Mulgedium (milk-weed). 142, Bipinnatifid leaf of Ambrosia artemisifolia (bog-weed). 269. Pinnatifid (pinna, feather, findo, to cleave) feather-cleft, the tissue somewhat sharply cleft between the veinlets about half way to the midvein, forming oblong segments. When the segments of a pinnatifid leaf are pointed and curved backward it becomes runcinate, i. e.t re-uncinate. When the terminal segment of a pinnatifid leaf is orbicular in figure and larger than any other, presenting the form of the ancient lyre, the form is termed Iyrate. Feather-veined leaves almost compound. 143, Nigella (pinnntisect). 144, Chelidonium ma-jus. 145, Thistle (Cirsium lanceolatum). 146, Dandelion (runcinate-lyrate). 270. Pinnately parte ) implies that the incisions arc deeper than pinnatifid, nearly reaching the midvein. 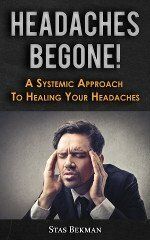 In either case the leaf is said to be sinuate when the incisions (sinuses) as well as the segments are rounded and flowing in outline. Such segments are lobes, and the leaves lobate or lobed, a very generic term. Peltate, shield-form, the petiole not inserted at the margin but in the midst of the lower surface of the blade. This singular form evidently results from the blending of the base lobes of a deeply cordate leaf, as seen in hydrocotyle. It may be orbicular, oval, etc. 272. Palmate forms. The following result from deficiency of tissue, causing deep divisions between the veins. Leaves thus dissected are said to be palmately-lobed when either the segments or the sinuses are somewhat rounded and continuous. The number of lobes is denoted by such terms as bilobate, trilobate, five-lobed, etc. 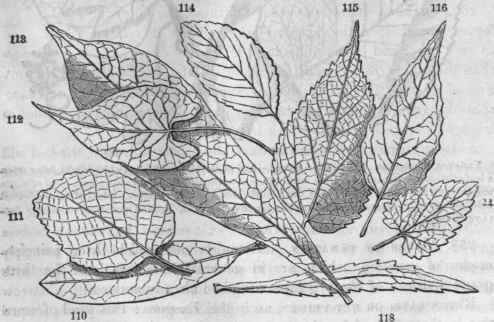 Palmate-veined leaves. 147, Menispermum Canadense. 143, Passiflora cerulea. 149, Broussonetia papyrifera. 150, Oak geranium. 273. The pedate, like a bird's foot, having the lowest pair of veinlets enlarged, recurved, and bearing each several of the segments (148). 275. The linear, long and narrow, with parallel margins, like the leaves of the grasses - a form which may also occur in the pinnate-veined leaf, when the veinlets are all equally shortened. The ensiform, or sword-shaped, is also linear, but has its edges vertical, that is, directed upward and downward. 276. If the veins curve, we may have the lanceolate, elliptical, or even orbicular forms; and if the lower curve downward, the cordate, sagittate, etc., all of which are shown in the cuts. The palmate or radiate form is finely illustrated in the palmetto and other palms, whose large, fan-shaped leaves are appropriately termed flabel-liform (fan-shaped). 277. The leaves of the pine and the fir tribe (Coniferae) generally are parallel-veined also, and remarkable for their contracted forms, in which there is no distinction of petiole or blade. Such are the acerose (needle-shaped) leaves of the pine, the subulate (awl-shaped) and scale-form leaves of the cedars, etc. 151. Ensiform leaves of iris. 152, Acerose leaves of Pinus. 153, Subulate leaves of Juniperus communis.